A wine bottle hummingbird feeder is a special way to combine a wine lover's joy of wine with their love of bird feeding. Many styles of feeders are available and they are very easy to make - a great way to recycle empty wine bottles and a perfect gift for a wine lover! Wine bottles are taking on a new function - hummingbird feeders. Manufacturers and crafters are using recycled wine bottles to create fun, beautiful and functional wine bottle hummingbird feeders. They use every bottle size, from mini bottles to 750 ml bottles. A bottle, a little copper wire, a feeder tube and a little time is all you need to recycle a wine bottle into a stylish hummingbird feeder. Making a hummingbird feeder is a particularly wonderful way to save a special bottle that has significant meaning to you or the person to whom you want to give a special gift. If crafts are not your first love, you can always purchase beautiful feeders from a variety of retailers. Hummingbird feeders have been available to bird fanciers in the scientific community since the late 1920s. It took the invention of the strobe flash and a National Geographic article in 1947 showing hummingbirds in flight to attract the attention of bird fanciers throughout the world. In just three years, the Audubon Novelty Company developed an affordable hummingbird feeder that began the current interest in hummingbird feeding and the wide assortment of feeders currently available. The concept is very simple. 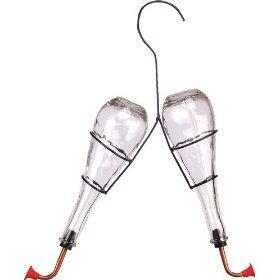 Surround a clean wine bottle with copper wire, add a feeding tube and hang the bottle upside down. 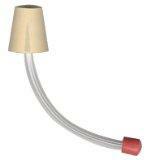 Hang your newly-created feeder in the shade, either from a branch or under the eaves of your home or apartment. Mini bottles (50 ml) or split size, half-bottles (375 ml) produce a small feeder, excellent for small porches or when hung in groups to satisfy a group of hummingbirds. The only downside to a smaller bottle is that it will require frequent refilling of "nectar", especially if you are lucky enough to have a large quantity of frequent hummingbird visitors. Full size wine bottles (750 ml) recycle into attractive feeders and can easily provide sufficient "nectar" for several weeks without the need to refill. The color of the bottle does not matter. 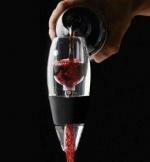 If you are lucky enough to find a red colored wine bottle that would certainly add to the attraction, but it is not necessary to have a red bottle to have a successful feeder. There is no need to remove the label from the bottle before it is recycled into a feeder. In fact, if the label has any red printing, the label could act as an attractant to the hummingbirds since they are drawn to the color red. Wrap six or eight gauge copper wire around the neck of the bottle several times - Continue wrapping the wire around the bottle until you reach the base. This creates a spiral wire cage around the bottle. Wind the last three feet of wire into a hanger - For a larger, heavier bottle, you may find that you want to use the heavier gauge copper wire. Some people add red food coloring to the sugar water to further attract the hummingbird to the clear feeding tube, though it is not necessary. Sugar water will keep in the refrigerator for up to two weeks.